Berlin ; New York : Mouton de Gruyter, 2009. Language and languages -- Word frequency. doi.org De Gruyter English-language e-books. UCB Access. by Ioan-Iovitz Popescu in co-operation with Gabriel Altmann [and others]. Add tags for "Word frequency studies". Be the first. 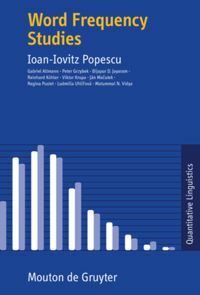 schema:isPartOf <http://worldcat.org/issn/0179-3616> ; # Quantitative linguistics.